Poultry farmers are often faced with injured hens and at times even the death of their hens because of an aggressive rooster. At times, the aggressiveness is so severe that it can even result in cannibalism. Poor diet, cramped coops and boredom among roosters seem to be the main causes of aggressive behavior. 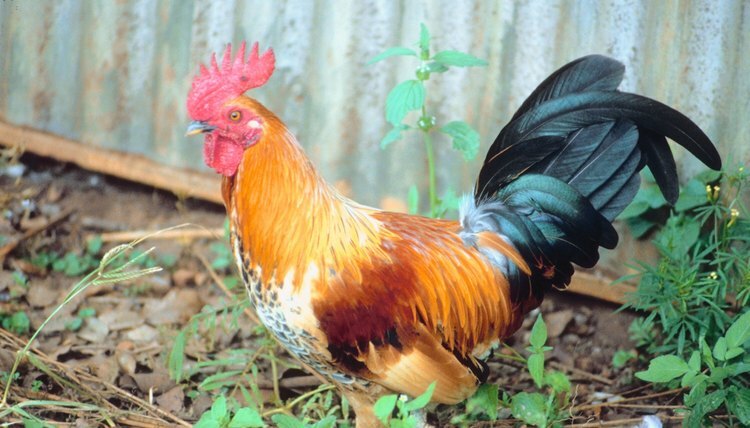 Roosters may peck at the hens during the mating season. If a rooster pecks the back of a hen's neck without really hurting it while going around it in circles, it may well be part of the mating ritual. You can reduce the feather loss among hens due to mating by clipping the rooster's nails and spurs. Cramped coops and paucity of space seems to be another reason for aggressive behavior among roosters. Ideally, an area of 5 to 8 square feet per bird is recommended if they are kept in the coop all day, recommends Chicken Keeping Secrets, a website related to rearing chickens. A space of 4 square feet per chicken is sufficient if the birds are left out during the day. A breather for an hour per day is good for birds that are kept in cages. Dimming the light in the coop can prevent a rooster from hurting hens, as this tends to reduce activity levels among the birds. Bare and wired coop flooring seems to hurt the sensitive feet of the chicken and induce aggressive behavior. Straw and wood shavings make good litter material for chicken coops and at the same time, these materials tend to satisfy the natural nesting instincts of the birds. Avoid using sand on the coop floor, as it is harsh on the chickens' feet. Inadequate diet seems to be another reason for biting among chickens. A diet consisting of high fiber is best for chickens, including roosters, according to Robert Plamondon's Poultry Pages, a website specialized in poultry farming. Feeding whole oats, rolled oats, alfalfa hay and alfalfa meal can prevent the rooster from attacking hens. Also, allowing the birds to feed in a free range can take care of their dietary needs, including vitamins and proteins. A change from chicken pellets to chicken mash also appears to reduce aggressiveness. Insufficient salt intake also seems to prompt aggressiveness among roosters. Adding a tablespoon of salt to every gallon of water will take care of salt deficiency among roosters. However, replace the saltwater with fresh water later in the day. Provide saltwater every three days, recommends Plamondon's Poultry Pages. Some roosters tend to be aggressive when they are bored. Arrange bales of hay in different levels to make a playground for roosters and hens. This will keep them busy exploring the bales, according to Chicken Keeping Secrets. You can try other things to keep a bored rooster busy, such as hanging a basket laden with greens out of the bird's reach. The rooster and hens will attempt to jump at the basket to get to the greens and this will keep them busy and occupied. Application of pine tar, which can be bought from feed stores and garden supply stores, on the bruised skin of hens seems to serve two purposes. The unpleasant taste of the tar keeps the rooster at bay and prevents further injury to the region that is injured and also facilitates gradual healing of the wound.